Suppose you have 9 coins. They are all identical (look, feel, smell, taste, etc. ), except one of them is fake and weighs a little more. You also have a binary scale. 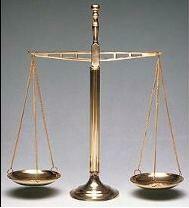 That is, it can only tell if one side is heavier than the other, but cannot quantify the difference (see picture below). Using the scale only 2 times, how can you find the fake coin? Using scale = putting coins on it and seeing which side is heavier. Split up into groups and come up with cool group names! Write HTML code (using 1 table) to display a standard 8x8 chess board. Half of the squares must be white, the other half black. None of the white squares may share a side with another white square (normal chess board configuration). Display the standard pieces on the chessboard in their initial positions. Use the img tag to display images for the chess pieces. Okay, so making you write HTML for 64 cells is a little cruel, so just do the 16 cells that represent the initial placement of the white pieces. Find 5 solutions to the 8 queens problem and draw them out on paper. There are a total of 12 correct solutions, where 2 are mirrors or rotations of another solution. So there are 10 really interesting solutions. You may NOT use the solution that is expressed in the image at the top of the page. As everyone knows, knights tell the truth all the time, and liars lie all the time. At least, this is what evenly behaved knights and liars do. Less known is that there are also odd knights, who on odd-numbered days lie all the time. (On even-numbered days, however, they behave evenly, and tell the truth.) Also, there are odd liars, who on odd-numbered days, tell the truth about everything, while they lie the rest of the days. Someone said: "Today's the 3rd. Trust me, I'm telling the truth. I'm odd. I'm not a knight. My eyes are brown." At first, this seemed illogical, and I thought he couldn't be either a knight or a liar, even or odd, but after a while the solution dawned on me and I found the error in my reasoning. What is he?